In a previous post I talked about the idea of "cheap code" to go with cheap hardware. Not every program has to be useful to the entire world or fit for general purpose -- it's fine to have a simple, ad-hoc script to do what you need to do quickly. I've been using this idea to build a simple home automation system for the connected devices in my house. The code isn't elegant. There's no user interface to add new devices or change settings. It's not even secure in any way. But it works and I have it now, and if I were aiming to make something I could box up and ship as a real product, I'd still be working on it. (Actually, that's not true. I'd lose interest and never finish it.) 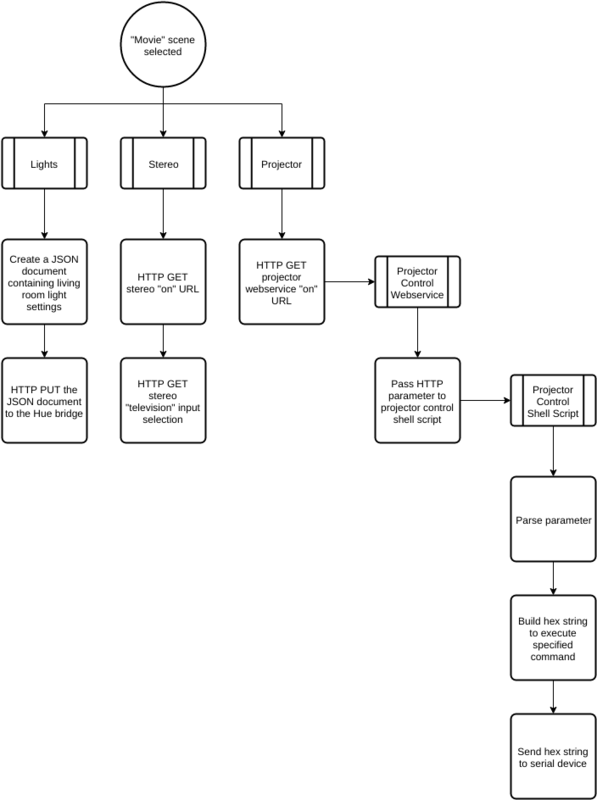 But even if the code I've written isn't generally useful, the structure and ideas could be. So with that in mind, here's a sketch of how all the pieces fit together. At a high level the architecture is pretty simple. At the center running the whole show is an Onion Omega, a cheap wifi-enabled computer made for prototyping and projects like these. 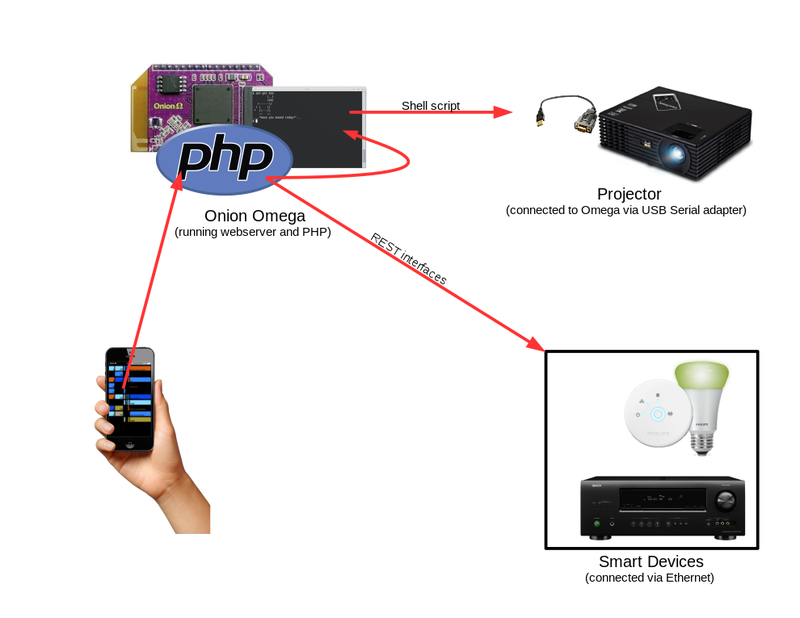 The Omega is running a webserver and PHP to serve up the remote control interface and process commands for the projector, which is connected via a USB serial interface. My stereo and lighting system are on the local network and can be controlled through HTTP requests. 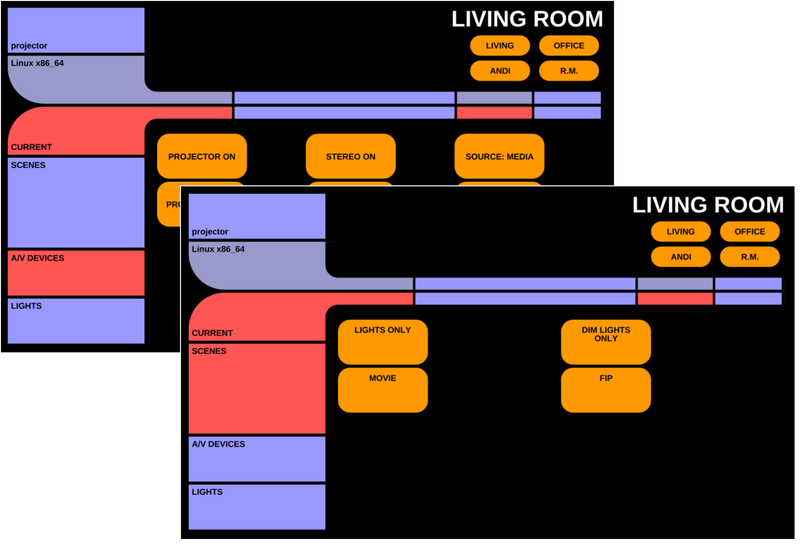 Yes, that is a Star Trek LCARS interface. And yes, I am a geek. The CSS is available on Github. The stereo is the easy one. It just requires an HTTP GET of a specific URL to set it to what I want. It does return some status information, but again I just ignore that. The Philips Hue system is only slightly more complex. 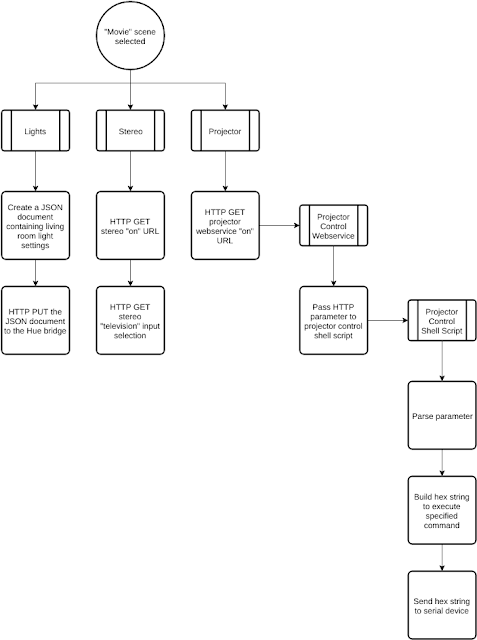 It requires an HTTP PUT rather than a GET, and expects a JSON document. While you can control color and brightness of individual bulbs, I just made some presets stored in the Hue itself for different lighting scenes and so only need a very simple JSON document to recall them. Probably the ugliest part of the whole thing is the projector. It doesn't have a REST interface like the other devices, but it does have a serial port. This is intended for industrial applications or control of the projector when it's mounted somewhere inaccessible, but it works just as well for people like me who are too lazy to keep track of yet another remote control. This is the only place where the Omega is doing anything more than serving static web pages. The PHP server on the Omega is used only to receive a projector command and pass it to a shell script that runs it. The PHP script is truly ugly, doing no error control or security checks -- it's a great way for someone to take control of my Omega or run malicious code there. But frankly there's nothing of value stored on it and to attack it they'd have to be on my local network anyway, meaning I have bigger problems. So I'm okay with this. That's really it. Nothing here is what I would call robust or beautiful, but it all works and was pretty easy to do. It's a great sort of project to tackle if you want to learn more about the Internet of Things or find a use for some of the cheap hardware that's available today. And these components can be further built on as you add new devices or want to add new functionality. Hi, well done. I did a similar thing couple of years ago, so I have some hacks as well if you want to elaborate on your project: (1) using an arduino with an IR led allows to control all devices with an IR remote. (2) usb/blootooth/wifi controllable power sockets allow to switch on/off all other gear (google for sis-pm, I am happy with their products and paid about 20,- for the USB version). (3) if you have a mac, applescript is your friend. it is very easy to implement things like "if I press play in iTunes, turn on the amplifier, switch it to the mac, and if it is late at night turn down the bass".